There are plenty of entrepreneurs in Hong Kong who dabble in F&B and many try their hand at tying together a casual night out that features both food and cocktails. 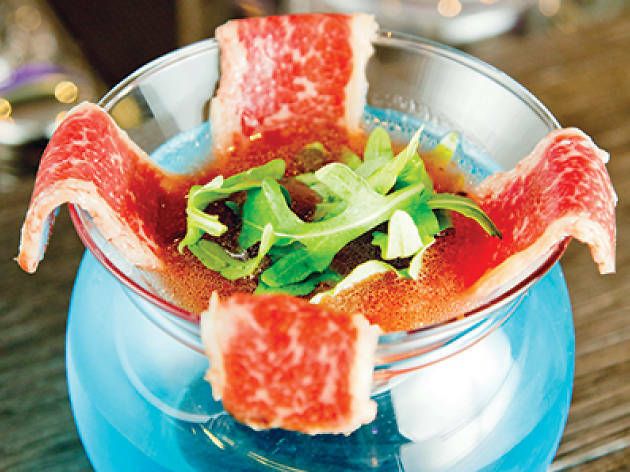 Taking the concept to its extremes, Cima Fine Dining Bar has fashioned ‘eatails’, a two-in-one cocktail and appetiser which aims to provide food and drink in one dish. Located three floors above Hennessy Road, the first thing that catches your attention are the plasma TVs affixed behind the bar that display a slideshow of celestial images. Then you notice the bar, where an aquarium serves as countertop with fish swimming beneath your drink. With such exciting décor we decide to be equally adventurous and order a wine cooler horse carpaccio ($150), where four thinly sliced pieces of horsemeat hang off the side of the glass. Visually intriguing, the cooler fails to add anything to the meat and what’s even more disappointing is the fact that it’s not recommended to drink the remainder of the eatail – we guess this one’s just for eating then. 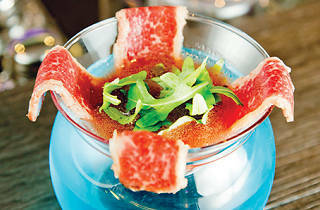 The beef sangria with cold beef ($180) fares better. In this eatail, beef is marinated for two weeks in red wine, garlic, ginger, soy sauce and orange slices, then served up as a side dish paired with a sangria mixed with freshly squeezed orange juice, triple sec and the beef marinade. The beef on its own is delicious; combined with the sangria it adds an aromatic flavour that swirls around your mouth with each bite. Sadly, once we finish the side of meat, the remaining wine on its own has a metallic aftertaste that’s an anti-climax after such an amazing pairing.